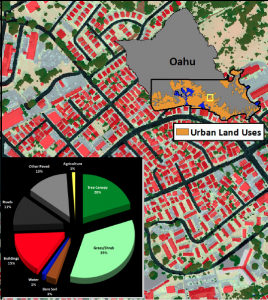 Kaulunani has conducted two Urban Tree Canopy Assessments of the major urban centers of O‘ahu. The study area includes 250 square miles of Leeward and Windward O‘ahu. The initial assessment completed in 2012 identified where trees are located, the extent of the canopy, as well as ownership and potential planting sites for enhancing the urban tree canopy. In 2016, we conducted a second Urban Tree Canopy analysis to assess the degree of change our a four year period from 2010 through 2013. What we found was alarming. Honolulu is losing tree canopy; in fact, we lost nearly 5% of our total urban tree canopy over four years. The majority of losses were in non-public zoning areas. Net Residential losses alone totaled 355 acres representing 39% of all the tree canopy loss. All land use areas saw decreases; even our conservation areas saw a 1% loss in tree canopy. Close to 98% of the losses were less than a quarter acre each and spread widely across the landscape. 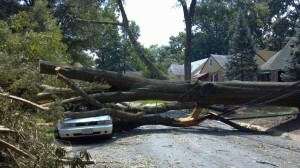 These losses equate to at least 76,600 trees. New plantings did occur totaling about 230 acres, which is far short of what is needed to keep pace with the losses, especially considering the time required to grow a canopy. Trees and tree-lined streets lead to more livable and cooler communities as well as healthier people. In addition, trees not only improve air quality, stormwater control and coastal water quality but also enrich businesses and provide energy savings. Take a Virtual Tour of the UTC map layers. To view the final 2012 report from the Spatial Analysis Lab, click here. To read the stakeholder proceedings from the presentations, click here. 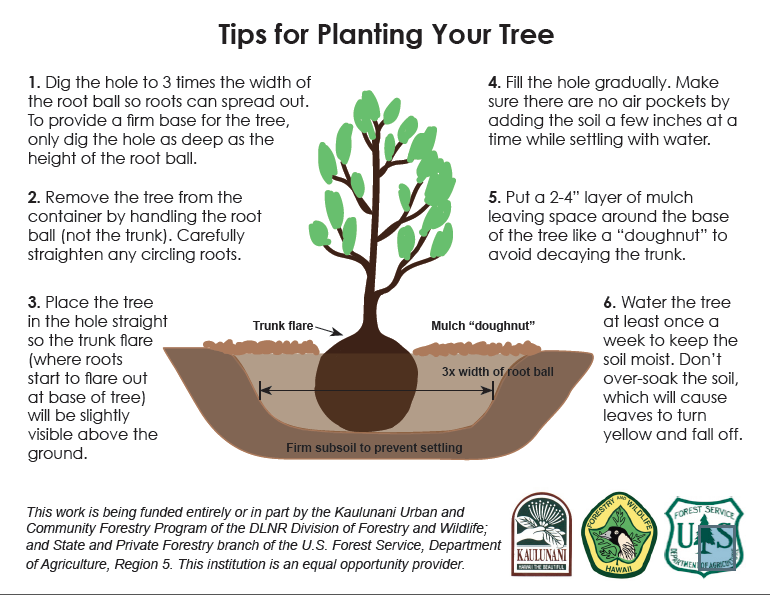 The Urban Tree Canopy Assessment is part of the long range Hawai‘i urban forestry strategy planning initiative conducted by Smart Trees Pacific in collaboration with the USDA Forest Service; the State DLNR Division of Forestry and Wildlife, the Kaulunani Urban and Community Forestry Program; the City and County of Honolulu, Department of Parks and Recreation Urban Forestry Division, and the Department of Planning and Permitting, Honolulu Land Information System. 2007 Technical report by the Center for Urban Forest Research, which combines results of a partial citywide inventory with benefit-cost modeling data. Value is calculated for benefits such as energy savings, CO2 reduction, air quality improvement, stormwater runoff reductions, aesthetic, property value, social, economic and other benefits. The report is based on 43,000 inventoried street trees and thus represents only a fraction of the entire urban forest of Honolulu. Nonetheless, the value of these benefits is still substantial. This user friendly guide provides urban forestry professionals concrete approaches when preparing for natural disasters that impact the urban forest. Dr. Ed Gilman from University of Florida, Jim Urban, FASLA, and Brian Kempf and Tyson Carroll of the Urban Tree Foundation have developed a modern, up-to-date, and peer reviewed set of details and specifications in AutoCAD, PDF, and Microsoft Word formats for the green industry. These are designed specifically for landscape architects, engineers, architects, contractors, urban foresters, arborists, municipalities, and state agencies. All these files are open source, free, and can be edited by the user. Web Map (City & County of Honolulu GIS) showing parcels with Exceptional Trees. Coconut Rhinoceros Beetle eradication effort (pamphlet 1.76MB PDF) Information on the eradication effort for this pest recently discovered on Oahu and how to help! Why Would Anyone Cut A Tree Down (book 1.6 MB PDF ) “we may not want to, but sometime we need to…” A children’s book about the benefits of trees and why, sometime we have to cut them down. Includes tips for choosing and planting right.